From the same geniuses that made Vikings Luxury Buffet a household name comes another food destination that will surely make everyone cooking, dipping and eating to your hearts' content and pleasure. 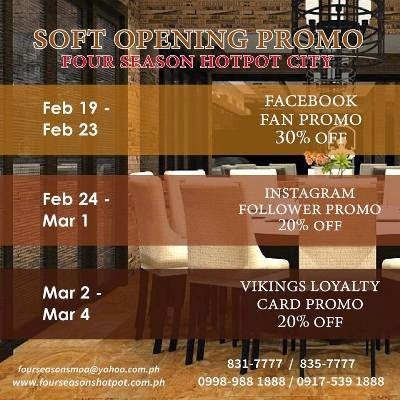 The Four Seasons Hotpot City is the newest eat-all-you-can restaurant at the Mall of Asia's SM by the Bay along with the aforementioned Vikings, Buffet 101, Banzai and La Fiesta. The eat-all-you-can hotpot is not entirely a new concept but the set-up, variety and overall appeal of Four Seasons will definitely make you want to try the each and every offering they have in store. No wonder that as early as 6pm, a line starts to build up where people are willing to wait as long as 2 hours to get inside as the restaurant's reservation list gets filled up few days prior. Hotpot lovers can choose from the wide assortment of fresh and healthy ingredients laid out buffet style. There's an appetizer and salad table, a Japanese section with limited sushi and sashimi options, a variety of seafood choices, a noodle corner, an array of dim sum and dumplings, my favorite meat section, vegetable shelves, selection of delicious desserts and a bar where you can get as much soda, beer, coffee, tea and several juice concoctions as you can possibly drink. Each table is equipped with a tabletop hotpot where you can cook your choice of ingredients depending on your taste and preference. Since the pot takes most of the space on the table, it gets a bit crowded when you get more than one tray at once. Good thing that the staff are very attentive when it comes to removing the excess plates and trays off our table. 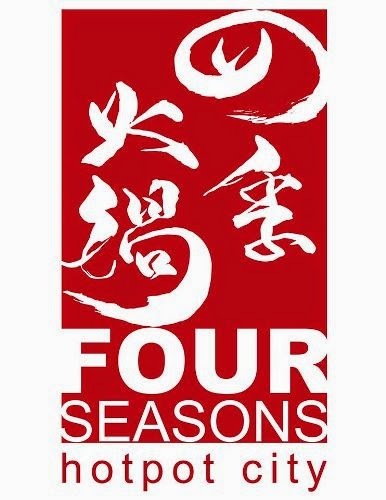 Four Seasons currently offers four soup bases for your hotpot that includes vegetarian, chicken, pork and sinigang. Yes, the popular Filipino sour soup can be your soup stock if you're adventurous enough to try something different. But as I always like satay on my hotpot, I asked the server if he can customize my side of the pot to satay soup to which he gladly obliged. Four Seasons offers a premium selection of beef, lamb and pork choices which a carnivore like myself enjoyed immensely. In fact, the staff who takes the orders already memorized our table number whenever she sees either CS or I placing our orders. With the extensive selection of ingredients, it was difficult for me to try them all so I just chose the ones that I like most such as plates after plates of beef and lamb, loads of mushrooms and pechay, sashimi and fresh beef balls, and veered off the stuff that are too heavy on the tummy to save some space for dessert. The restaurant is currently on its soft opening, which is the best time to visit and avail of their irresistable promotional rates as indicated below. Just make sure you call in advance to reserve a table or two, especially if you're dining with kids or a group.